At the dawn of the premiere of 20th Century Fox’s The Predator, you might remember what a great film the original was. First opening in theaters in 1987, Predator has become a classic sci-fi/action film that was even nominated for an Oscar (Best Effects, Visual Effects). What may be a testament to its quality is that none of the sequels have come even close to replicating the original, which also may come as warning about Fox’s remake. Predator stars Arnold Schwarzenegger, Carl Weathers, Kevin Peter Hall, Bill Duke and Jesse Ventura as several commandos on a mission in Central America to save hostages held by a guerrilla faction. But what they encounter is far more dangerous. It’s interesting to note The Predator director Shane Black actually appeared in Predator as commando Hawkins. 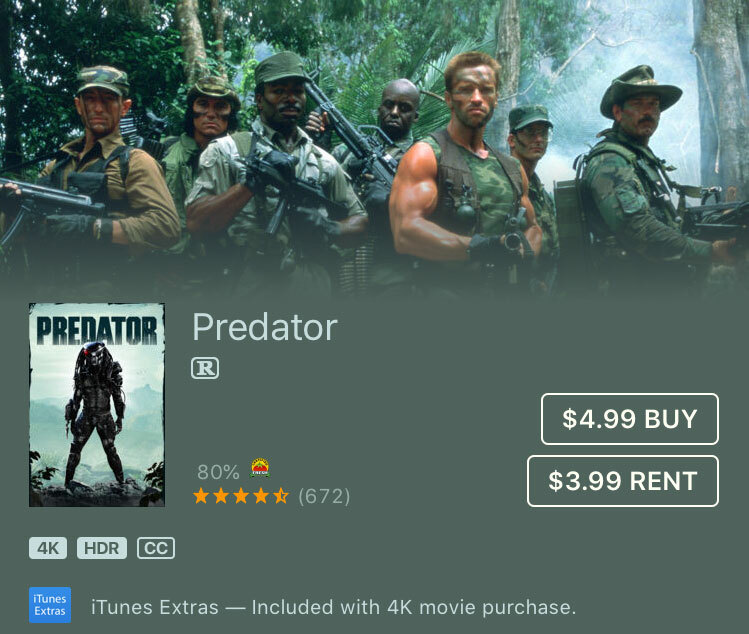 All that’s a long way of saying there’s a great deal on the digital edition of Predator in 4k. Today only, iTunes and 20th Century Fox are offering the film for only $4.99. The digital edition features 2160p resolution and HDR10 for High Dynamic Range color depth. Audio is provided in Dolby Digital 5.1, along with Closed Captioning. There is also extra bonus material with iTunes Extras. Apple is a Movies Anywhere partner so the purchased title should end up on a buyer’s other platforms such as Vudu, Google Play, and Amazon Video. However, depending on the service may not be available in 4k UHD. Also Read: Predator releasing to 4k Ultra HD Blu-ray.